Century Cycles Blog: It's a Pink Sweetheart miracle! We were able to get our hands on another Electra Pink Sweetheart Pajama Party bicycle and it's now on the floor at the Rocky River store. 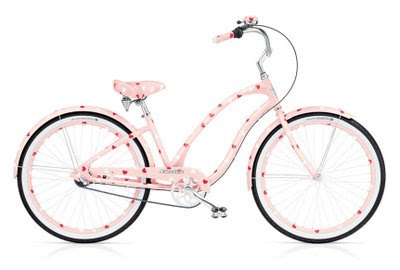 If you know somebody crazy for pink, or crazy for hearts (down to the rims and hand grips! ), or just crazy for cool bikes, then steer them our way. Steer, too, any resident Easter bunnies or Mother's Day gift-shoppers -- this bike would brighten any of those upcoming holidays. The last two Pink Sweethearts we had in stock were sold to avid Electra fans in California and Idaho, who found us through this little ol' blog. Here's hoping this one stays in the area, if only so we get to see it's heart-covered loveliness brightening our Ohio streets. Do they come in a nice Royal Purple, sans the hearts? I'm not exactly a heart type of gal. Oh, now that's pretty cute!